The Australian Chicken Meat Federation Inc. (ACMF) is the peak coordinating body for participants in the chicken meat industry in Australia. ACMF represents all elements of the industry, including chicken growers and processors, at the national level. 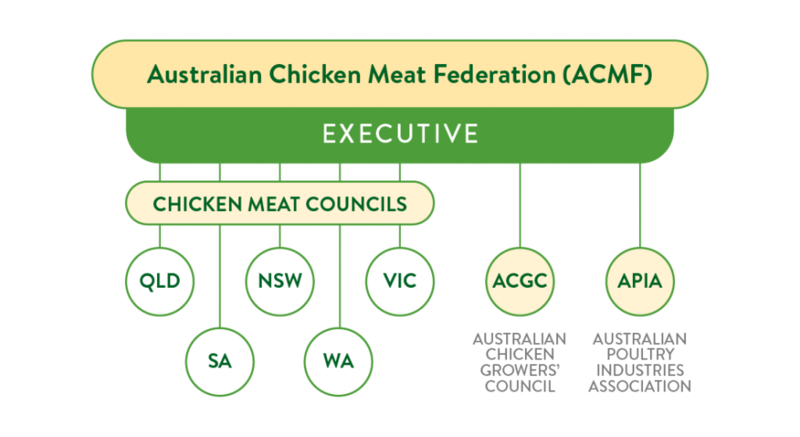 The ACMF was formed in 1964 and its members are the five State Chicken Meat Councils (Queensland, NSW, Victoria, SA and WA), the Australian Chicken Growers’ Council and the Australian Poultry Industries Association. The latter represents the chicken meat processors that produce 95 per cent of Australia’s chicken meat. Through its State organisations, ACMF also represents a range of other suppliers to the industry, providers of services to the industry, and customers of the industry, who are involved in the production and distribution of chicken meat in Australia. The main aim of the ACMF is to promote and represent the interests of the chicken meat industry. The ACMF represents the industry at the national level in matters regarding international trade, quarantine, animal health, biosecurity, food standards, food safety, animal welfare and a range of other areas affecting the Australian chicken industry. It is also actively involved in providing strategic direction to industry relevant research and development bodies, and is a signatory to the Emergency Animal Disease Response Agreement and member of Animal Health Australia. The ACMF has a key role in developing policy and setting standards for the chicken meat industry in Australia, including in areas such as food safety, animal welfare, farming and processing practices, biosecurity, disease prevention and management and environmental practices. One of the ACMF’s most important roles is to provide information about the Australian chicken industry, how it operates and about its products, to consumers and the public more broadly. State Chicken Meat Councils/Associations in Queensland, NSW, Victoria, South Australia and Western Australia each determine their own membership structure, but in all cases membership is open to the chicken processing companies and grower organisations in that state. Additionally, some state CMCs encourage membership from allied industries, such as pharmaceutical, equipment and packaging suppliers, genetic (breeding) and feed milling companies. Representation from academic bodies and state Department of Agriculture/Primary Industries is also welcomed in many cases.